ENTRY BY TICKET ONLY - On Thursday 22nd February 2018 the band will host and perform in a charity concert along with special guests, the Carrickfergus Grammar School Senior Choir under their Musical Director, Edward Craig and renowned mezzo soprano Sheelagh Greer. 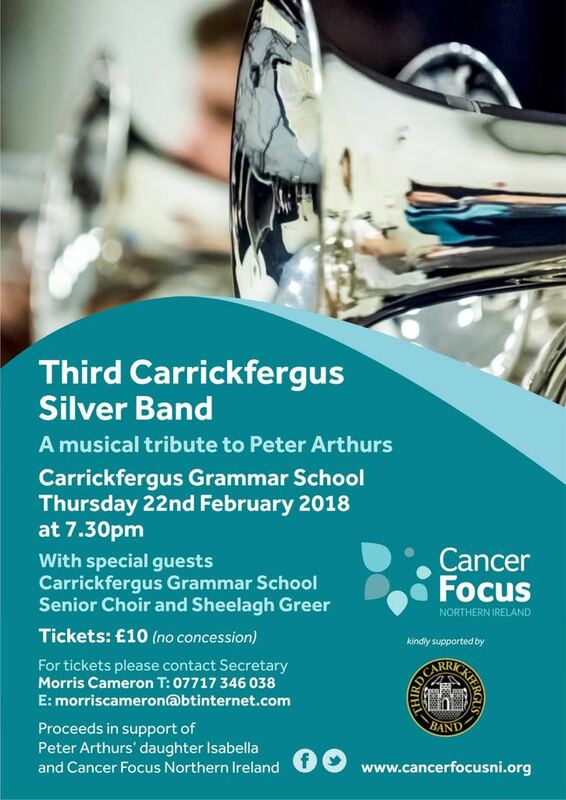 The concert will be held in Carrickfergus Grammar School and is our musical tribute to former soprano cornet player Peter Arthurs who tragically passed away in June last year at only 36 years of age leaving behind a loving and devoted wife Gillian and young daughter. The proceeds of the concert are in support of Peter's daughter, Isabella and also Cancer Focus Northern Ireland. We hope we can rely on your continued support and we look forward to seeing everyone on the night.